The Syngnathid family of fishes, including the sea horse, sea dragon, and pipefish, is known for its unique body plan and male brooding behavior. Here, Genome Biology ’s Dominique Morneau discusses the genomic basis for these exceptional traits. Generally, fish anatomy shares the same basic vertebrate body plan, though it shows extensive variation in a number of distinctive features, including head and jaw shape, characteristics of external organs like gills and scales, fins, and skeletal components. Fish anatomy is shaped by the physical characteristics of water, but there are some fish that have evolved unique body plans and features through diverse genetic changes. Recently, two groups have set out to unlock the genomic secrets of a fish family with very unusual morphologies. The Syngnathid family, which includes seahorses, sea dragons, and pipefish, is known for its unique body plan – a long snout and fused jaw used for “pipette” suction feeding, thick bony plates covering their elongated bodies, missing pelvic fins, and a gain of placenta-like structures in males used for brooding. These traits make Syngnathids particularly important for studying evolutionary novelty, but that requires a well-assembled genome from one of these species. Today, a reference-quality assembly of the Gulf pipefish (Syngnathus scovelli) genome has been published in Genome Biology, joining the genome assembly of the tiger tail seahorse (Hippocampus comes) recently published in Nature. The two Syngnathid genomes show that losses in specific genes or gene functions are responsible for evolutionary innovations. For example, both the pipefish and the seahorse have lost the tbx and pitx gene families, which occupy the top of the regulatory cascade involved in vertebrate hindlimb development. In fact, when the tbx4 gene was removed from zebrafish via CRISPR/Cas9 editing, these animals failed to develop a pelvic fin, but showed no other changes to their morphology. 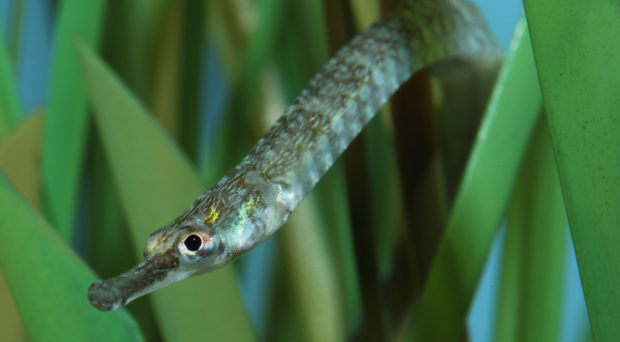 The pipefish genome also shows gene losses and unique arrangements in gene families responsible for head skeleton and limb development, and in body axis patterning. For example, the Gulf pipefish experienced differential loss of hox gene clusters after a whole-genome duplication event that occurred earlier in teleost evolution. These hox genes regulate the body plan along the head-tail axis in developing embryos. Some of the hox gene losses in the pipefish are shared with other related fish, though these seem to have occurred independently. Other important head and limb pattern-determining genes, like the dlx family, are completely lacking deeply conserved non-coding elements. Some of these elements were previously found to function in gene expression in specific subsets of these families. This phenomenon was also seen in the seahorse genome. Another unique and fascinating evolutionary innovation in the Syngnathid species is male pregnancy. Males gestate developing embryos in a specialized organ called a brood pouch. Pregnancy is marked by extensive cellular and developmental changes in the brood pouch. In the Gulf pipefish, over 1000 genes are differentially expressed in this tissue as a result of pregnancy. These genes control developmental processes, lipid transport, homeostasis, and the immune system. In fact, because of the loss of an important class of immune genes in the pipefish, the authors found a strong pregnancy-specific signature for innate immunity-related genes. In both the pipefish and the seahorse, patristacin genes are highly expressed during pregnancy. These genes promote egg hatching by lysing the chorion surrounding the egg. The increased expression of these genes is the result of an expansion of the gene family, likely playing a key role in the evolution of male pregnancy. The genomes of the Gulf pipefish and the tiger tail seahorse provide valuable information about the genetic basis of evolutionary innovations in this fish family. This fish family is being decimated as by-catch, and their charisma makes them victims to aquarium displays and traditional medicine, and so genomic information will also be useful in informing conservation efforts and maintaining genetic diversity in global populations.